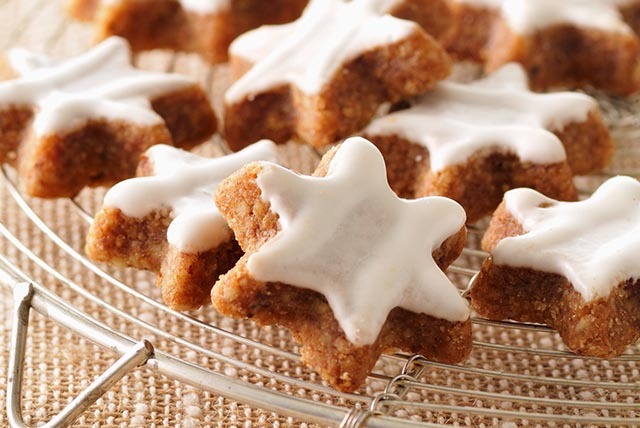 Creamy PHILADELPHIA Cream Cheese, fragrant spices and molasses all team up to make the dough for these easy-to-make gingerbread cookies - perfect for the holiday season and gift-giving (if you can bring yourself to give some of these delicious cookies away!). Combine flour, spices and baking powder. Beat cream cheese, sugar, molasses, butter and vanilla in large bowl with mixer until blended. Gradually add flour mixture, mixing well after each addition. Divide dough in half; flatten each into disk. Wrap individually in plastic wrap. Refrigerate 1 hour. Heat oven to 350ºF. Roll out 1 disk on lightly floured surface to 1/4-inch thickness. Cut into star shapes, using 3-inch cookie cutter and rerolling scraps as necessary. Place, 1 inch apart, on parchment-covered baking sheets. Repeat with remaining dough. Bake 12 to 15 min. or until edges are lightly browned. Cool on baking sheets 1 min. Remove to wire racks; cool completely. Mix icing sugar with water; blend until smooth, adding a small amount of water as needed to get desired consistency. Spread cookies with frosting. Prepare dough and flatten into disks as directed. Wrap tightly; freeze up to 1 month. Thaw in refrigerator overnight before rolling out. Bake as directed.